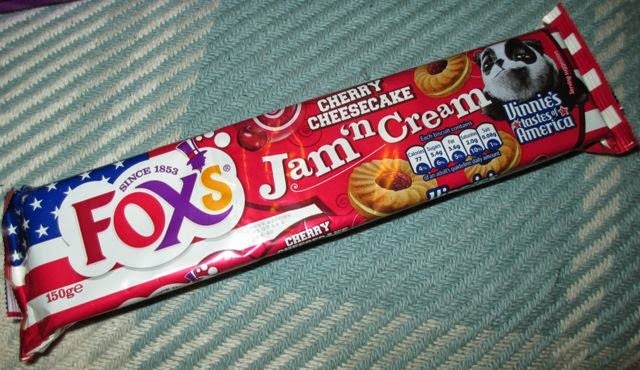 These new biscuits from Fox’s continue their American flavours range, and they have taken the epitome of a British biscuit, the jammy ring biscuit, and given it a twist from The States. The flavour is Cherry Cheesecake, and in order to convey that they have choses a Digestive biscuit as a base flavour, a creamy layer between the two biscuit pieces and cherry jam. The first thing you notice when you bite in is the taste of the Digestive base. It is very wheaty tasting, and it felt strange as I’ve been conditioned to think these sort of biscuits should have a more creamy taste. Once I got used to it though, I did really start to like it. The next part is the cherry jam, it is pleasingly zingy and the tartness works well with the other flavours. Its fresh, sweet and has a slightly sour aftertaste, and this complexity meant it worked rather well. It was described as “Very Cherry” on the side of the packet and it lived up to that. The creamy layer comes across as more of a vanilla cream, but there is a hint of something in the flavour making it feel a bit more like a cheesecake. In honesty thought though the major cheesecake association is from the biscuit layer, many cheesecake having a crushed Digestive base. I liked these biscuits and felt the cherry flavour was a nice twist, as was the combination with the biscuit type. These get the thumbs up from me, and make me look forward to trying the other new flavours too.